On 16th January 2003, Space Shuttle Columbia lifted off the ground at 15:39:00 (UTC) from Kennedy Space Center in Florida, USA. The mission duration was 16 days. Columbia was destroyed during atmosphere reentry on 1st February 2003 at 13:59:32 (UTC). The destruction of Space Shuttle Columbia was due to a piece of foam that broke off during launch and damaged the thermal protection system, leading to the loss of all crew members. 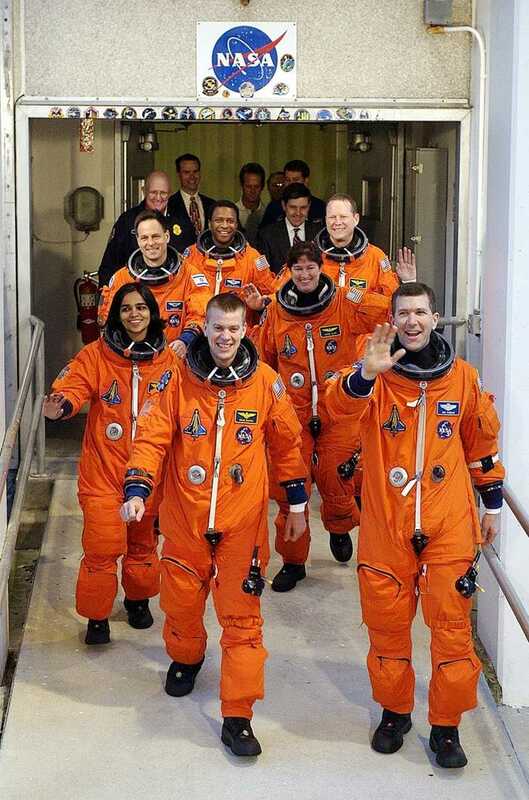 Today marks the 11th anniversary of Columbia disaster, one of the major tragedies of spaceflight history. It is an occasion to remember that going to space is still not routine. Columbia was the first fully operational orbiter of the Shuttle Space Program. Its inaugural flight was on 25th March 1981. While the Space Shuttle Columbia was under construction, several delays were experienced due to problems with the main engine and trouble with the thermal protection system. An accident also occurred in the aft engine compartment involving nitrogen, which provoked the anoxia of five workers, three of whom died. Shuttle Columbia’s STS-107 Crew – Rear (L-R): Ilan Ramon (payload specialist), Michael P. Anderson (payload commander), David M. Brown (mission specialist) Middle (L-R): Kalpana Chawla (mission specialist), Laurel B. Clark (mission specialist) Front (L-R): William C. McCool (pilot), Rick D. Husband (commander). – Credits: NASA. STS-107 was Shuttle Columbia’s 28th mission which lasted 15 days, 22 hours, 20 minutes, 32 seconds. The mission primarily involved scientific experimentation dedicated to microgravity and Earth Science. The on-orbit mission took place normally and successfully met its objectives. Neither the crew nor ground support detected any incident during the launch preparation or lift-off phases. Ground support only detected an anomaly 24 hours after launch whilst reviewing films and camera photography. Although engineers expressed concern about the consequences of the impacting chunk of foam on Columbia’s exterior, these concerns were not successfully communicated to managers. Columbia behaved normally during the launch, the mission, and at the beginning of the reentry into the atmosphere. The first problem was only detected 270 seconds after reentry began. Debris fell over a large surface area which made it difficult and time-consuming to recover. During the air search, a helicopter experienced a technical problem and regrettably caused the death of two people and injured three others. The Columbia Accident Investigation Board published its final report on 26th August 2003. The investigation covered a number of areas including: the context of the accident, all possible technical factors, and NASA as an organization. It determined that the accident was caused by both technical faults and a lack of concern from NASA management regarding safety. 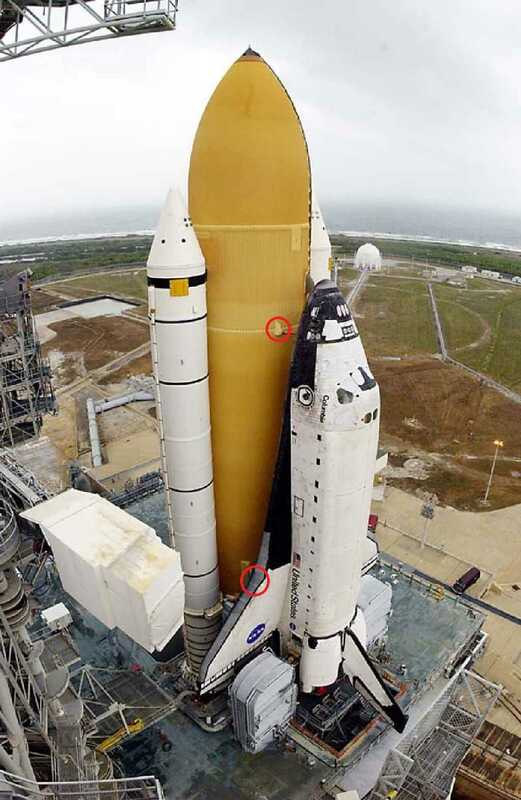 Space Shuttle Columbia before lift-off; Red circles highlight problem areas which caused the failure on reentry (Credits: NASA). Regarding technical causes, it was discovered that 82 seconds after launch a piece of insulating foam, roughly the size of a suitcase, separated from the External Tank causing a breach in the Thermal Protection System on the left wing. During reentry this breach resulted in overheating which melted the structure of the wing and caused the destruction of the Orbiter. Concerning organizational causes, the board reported that “causes of this accident are rooted in the Space Shuttle Program’s history and culture.” The Space Shuttle Program involved reusable space vehicles, which implies a high launch frequency in order to meet financial goals. This basis was the foundation of many factors that were conducive to the accident such as: “budget, culture, organization, and safety practices.” All of these contributed to an altered definition of “acceptable risk.” Many previous launches involved loss of isolated foam on the Shuttle, but this risk had always been treated as minor. The investigation also resulted in a number of recommendations for future safety improvements. These included on-orbit inspection of the Orbiter as well as emergency procedures for repair or possible rescue strategies. If management had not dismissed the concerns expressed by engineers there may have been potential to return the crew safely by utilizing Space Shuttle Atlantis in a rescue mission. This accident took place in the shadow of Challenger, which was destroyed during lift-off on 28th January 1986 due to an O-ring malfunction. That first shuttle accident was shocking not only to Americans, but the rest of the world as well. What was considered a reliable system had suddenly demonstrated that even NASA was not invincible. NASA’s organizational structure and management were fingered for failing to address engineering concerns in that incident, much like the Columbia disaster. The Space Shuttle Columbia disaster was NASA’s third fatal accident and it highlighted many problems regarding the safety of the Space Shuttle program. The Columbia Accident Investigation Board concluded that NASA was not listening to external recommendations. The Board was not confident that the Space Shuttle was able to safely continue human spaceflight for more than a few years. The Shuttle was consequently retired and last flew in 2011. Spaceflight is inherently risky; for there to be zero risk to humans during spaceflight, we would need to stay on the ground. This risk is a whole component of space exploration. We could stop, but astronauts would have died in vain if NASA did not continue their exploration of space, learning from the mistakes of the past. Both the Challenger explosion and the loss of Shuttle Columbia shone light on the true risks and benefits of human spaceflight. Columbia Accident Investigation Board, 2003, Report, Vol.1.